The BBA or the Bachelor of Business Administration is the undergraduate level course of management. It is considered to be the perfect course for anyone interested in doing MBA in future. You can apply for the course irrespective of your senior secondary background. The admission to this course is mostly done on the basis of the class 12th marks, though, some colleges or universities take entrance tests too. The BBA courses in Lucknow are a precursor to the highly recognizable MBA program. The undergraduate program is more concerned with the various fundamental topics related to business operation and its management. If you want to learn all the basics of management then this is the course for you. You can select any of them for your specialization in the MBA program after graduating from this program. Apart from these topics, you will also have to complete various projects and undergo several internships and training similar to the postgraduate management program. The BBA courses in Uttar Pradesh will equip you with enough knowledge that you can start your own venture with confidence. The startups are the toast of the nation right now. The “Startup India” initiative of the Indian Government is geared towards promoting entrepreneurship in India. It’s the best time to open a company in India. The interaction with the fellow students from diverse cultures and backgrounds will widen your thinking ability and knowledge. The several seminars and projects will prepare you for the life ahead as a management professional. You will learn to think in an analytical way by calculating all the pros and cons before making any decision. 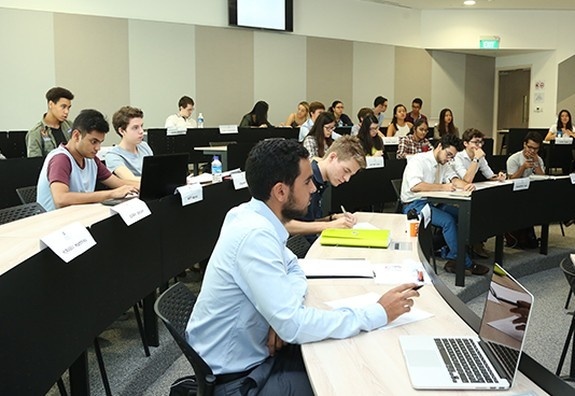 Many students find their business partner during the course of their BBA program. The life of the management professionals requires them to manage a group of people. At times, the various people in the group can have different opinions or suggestions, however, it’s the job of the management professionals to lead them in an effective manner to get the maximum work output from them. They should keep everyone motivated towards their work so that that they perform up to their best level. The Bachelor of Business Administration program will develop your communication skills. The ability to effectively communicate with every concerned person is the key to management. Often, you have to give presentations in front of people or speak in front of a huge audience. Your undergraduate program will prepare you for such occasion through its various course module. The job market is getting tougher by each day. Currently, only the highly skillful candidates are able to get a good job. That makes the BBA courses in Lucknow all the more important. Various industries need such graduates offering them good remunerations compared to other graduates. Apart from job opportunities and the higher studies, it provides the perfect knowledge to individuals to become entrepreneurship.